marriage | Follow the Tumble Lees! From my personal blog. Our winter travels are officially over, but still have a few more blog posts. This post was what we were coping with all winter as we learned about heart disease and learned a new way of eating and better exercising. We also learned a lot about traveling although it’s been 3 1/2 years! We know one thing, we’re going to keep on keepin’ on! Aren’t we the picture of health? Photo taken August 2016 Is it just us, or has anyone else noticed something interesting about pharmaceutical commercials these days? They show a good-looking couple, middle-aged (whatever that is to the viewer) out having fun: bike riding, playing golf, playing with their child or grandchild, walking and holding hands in a romantic setting? (Maybe like this picture?) Then the commercial begins, “See your doctor about taking XYZ drug.” Then in fine print and a VERY low and fast voice, you are warned that this drug could cause paralysis, blindness, heart attack, or some other more serious cause of death? And then as soon as that is over, a law firm advertises: ”If you have ever taken such and such drug and you have cancer, it’s been determined that drug caused the cancer and we will sue for $millions for YOU!” What’s with this? I wrote this on my personal blog. But it fits here under our marriage category! And I always pray when I learn of another couple divorcing. My heart aches for them. We understand. We’ve been through it. And then we had a miraculous reconciliation! That’s our hope and prayer for all concerned! Previously used in Arpita’s Life as guest blogger. We’ve been members of and active in three churches. In the last church, I was on the visitation team. I loved visiting our shut-ins and people who just needed a friendly visit. Most of those I visited were on the elderly side, generally, 80 and older. I relished the wisdom they shared as we talked. Several of them said things to me that I’ll never forget and some I want to model into my old age! Phew, what a journey we have been on since we first attempted to leave Myrtle Beach. Since purchasing our 40 foot Class A motorhome this past May, we’ve really tried to travel at a leisurely pace. But things keep coming up to hinder our desire – or to cause us to hasten our journey. While we do completely enjoy our new spacious and luxurious home (but with a minimalist theme), we miss our nibble X-tra Lite 5th wheel that handled speed a little better. Arrival: We wrote about our difficulty getting out of Myrtle Beach here to arrive at our current location. We are near our daughter and her family (including our two precious grandsons). Our total stay will be about six weeks. While we averted a major disaster (and those of us in the lifestyle know that is always a possibility), the worst part is we arrived here a bit un-rested to begin helping our daughter as she returned to work after three months of maternity leave. The oldest is now two years old and three months and the baby is three months old. At our age (eligible for social security), we don’t have the energy we would prefer to have as we care for these precious boys. We’ve heard being grandparents helps keep a person younger. We are sure hoping for this! Anyway, we wanted to arrive a day ahead to set up camp and get “acclimated” to our new environment – from the beach to a forest-type campground. And REST from the trip. Since we didn’t have that luxury, we set up “camp” quickly and then headed off to pick up our two-year-old grandson from daycare. Once at home, we packed his overnight bag and he spent the night. He loves our motorhome and we love having him spend the night. Rest is over-rated, right? Getting in the swing of things: Aside from wanting to be with our daughter and her family for the holidays, our main reason for being here is to take care of our infant grandson while our daughter returns to work. We don’t want the baby in daycare until as long as possible….so we hope to have him ready for daycare by the end of December/early January. While we wished we could keep him out of it, his parents both work and we just can’t do it at this time. Bill told our daughter before she had children, he would not help her raise them….but he is eating his words a bit….he can’t get enough of them and time will tell what happens down the road…. New adventure: In the past 10 years, at any of our church congregational events, I was usually seen holding a baby. What a great legacy to be known as a lover of babies! And the greatest privilege was to be asked to help take care of 6-week old infant twins. That really got my juices going to one day be a grandma. And people told me frequently I would be a wonderful grandma. So when our first grandson was to arrive, we did change our lifestyle to see him more (sold everything and began traveling full-time). Aside from being present at the birth of #1 grandson (and subsequently #2), we also took care of #1 for a month to also keep him out of daycare a little longer after our daughter returned to work. What a time of joy and special bonding that was! But at this same time, Bill was beginning to live his dream of traveling. And I was on board, but I’m very torn….I want it all!!! So we are now watching #2 grandson as we did with #1. But we are two years older. And sadly, we are now 30 minutes away from their house, rather than the 10 minutes the first time. So all that to say, the JOY of this new baby is like an adrenaline rush! I am getting up very early to be at my daughter’s house by 6:15. In essence, I put in a 12 hour day, not including the commute. While here at the house, since he does sleep a lot, I help with housework, laundry and shopping. Bill is the chief cook! And then we play and enjoy our grandsons to the fullest. We love our daughter tremendously, but honestly, we don’t remember all these fun times with her as we are having with our grandsons. Since we both also worked full time, we just don’t remember much about her early months and years. So how wonderful now as grandparents, we get to experience the awe and wonder as we watch these babies and toddlers go through as they explore life. We are cherishing our time here, but it is winter and cold….so we will depart the end of December or first of January for warmer climates. Grandson #2 is helping us etch into our minds the beauty of birth and dependence of precious children on the adults around them. It is like a new adventure with #2! How is our new home handling winter? When we bought our 5th wheel, a sticker by the entrance door said, “Polar Pack.” And we latched on to the statement while the salesman warned us, it didn’t mean it could go much below freezing. And we discovered it didn’t like freezing weather as our pipes froze on us as we fled south last January. Remember the polar vortex that hit the east coast of the US? We couldn’t outrun it…. We are happy to report we are very pleased with our new home. While it doesn’t have any type of “polar pack,” it has better insulation. We have been able to keep it toasty warm for our grandsons when they come to stay overnight. That is huge! We also learned a few lessons last winter. For one, we now have an insulated and heated water hose. We also did learn a few other tricks for surviving in freezing temps. I’ll save that for a later post….after we bonafide survive this winter! What are our fun adventures besides our Monday-Friday routine? During the week, we also still have our own responsibilities, like processing the mail, balancing the checkbook, seeing doctors for routine stuff us older folks have to deal with, grocery shopping, and for Bill, to keep our vehicles clean and shiny! We are constantly asked if our home is a 2015 or 2016! Everyone is shocked it is a 2010! Yep, Bill keeps it polished! But come the weekend, we do want to have fun with the family. Here are some links for a sneak preview about the fun we have been having: We started out with our visit to the ICE 2015 Christmas at the Gaylord National Resort; a day trip to the Shenandoah National Park to hike; a return to Williamsburg, a family tradition; and more! We are also enjoying our Sunday morning times of corporate worship at Spotswood Baptist Church. We especially love attending church during the Christmas season. It just makes it really Christmas, singing Christmas carols and hymns about the birth of our Lord and Savior! I wrote a blog, here, about this past service. So that is all the good. Sadly, we also experienced the sad part of life. I remember being told as a child, there are three things you can count on in life: births, death and taxes. Bill and I have already experienced the death of our dad’s. I was so blessed to have a dear step-dad, Cliff Duncan when my mom remarried after being alone for five years. Mom did pretty well, but she began to lose her sight. And then my middle sister and his oldest daughter “fixed” them up. He had recently lost his wife. Cliff loved traveling in an RV. He and his first wife traveled extensively around the country, including to Alaska in a motorhome! They started small and owned about every type they make. 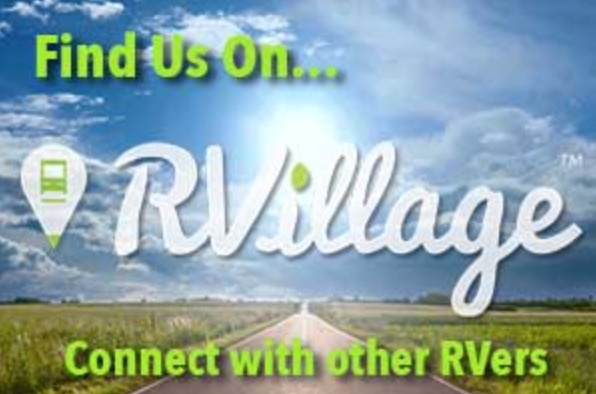 My parents owned a travel trailer, but they kept it at an RV resort. Mom always wanted to take it on the road….so she finally got on the road with her new husband. My tribute to him..
Could you change if it was really important? A study of 3,700 people who were diagnosed with high cholesterol determined only one in 10 can….They were told for their health, they need to take one pill a day. By the 3rd month, 1/2 had stopped taking the pill to lower it. Then, a year later, only 1/3 continued to take the life-saving medicine. The reason? The pills reminded them they were sick. So the bottom line was, they didn’t resist the change, they resisted being changed. We couldn’t believe the sermon this week sounded like what we needed from the sermon the week before, Changing Your Minds. Maybe this is what I (Debbie) need to really make that final change I have been struggling with for over 40 years! To be very honest, I’ve noticed I’m not the only wife with this “problem.” Bill was happy to hear I really am serious about tackling this with our new lifestyle. Those 400 or so square feet we now live in means we REALLY need to get along. And for the most part, we do, almost all the time. If you’ve read some of our first posts about our marriage (we divorced after 13 years only to experience a miracle and remarry a year later), you’d know we are like most married couples. We started out thinking we are the perfect couple and we will have the best marriage ever. And then eventually, reality hits and again, like most marriages, we began to experience the common issues men and women have. Disagreements. When we remarried, we vowed we would do it right the second time and we honestly gave ourselves over to the Lord for His guidance. We recently shared as guest bloggers on Aprita’s World, what we feel is about the best advice we can give young marrieds. So you would think we have the perfect marriage now. Well, we are working on it and as our last post shared, there is hope if we allow the Lord to work in our lives. So the challenge the week after the sermon was to see how it played out. And then we had another “detour” to our vacation in Myrtle Beach. This time, our daughter needed some help. The solution was for us to drive 400 miles one way to pick up our oldest grandson. We actually had tried to get her to come for a week with both grandsons, but we know traveling with a newborn and an active toddler wouldn’t be easy. We had a great time with him, but our focus was purely on him and only him! So no time for me to see if I had really changed, but something told me, I hadn’t. As we dealt with him, I couldn’t help but ask, “Lord do I act like a two-year-old toddler when you are trying to get me to do the right thing?” You know what I mean, “I want to do it MY way!” Oh, our patience was tested. We worked as a beautiful team, keeping him safe and helping explore a new world, the beach, and gardens. Off to church, we went on Sunday, taking him along to enjoy the church nursery. 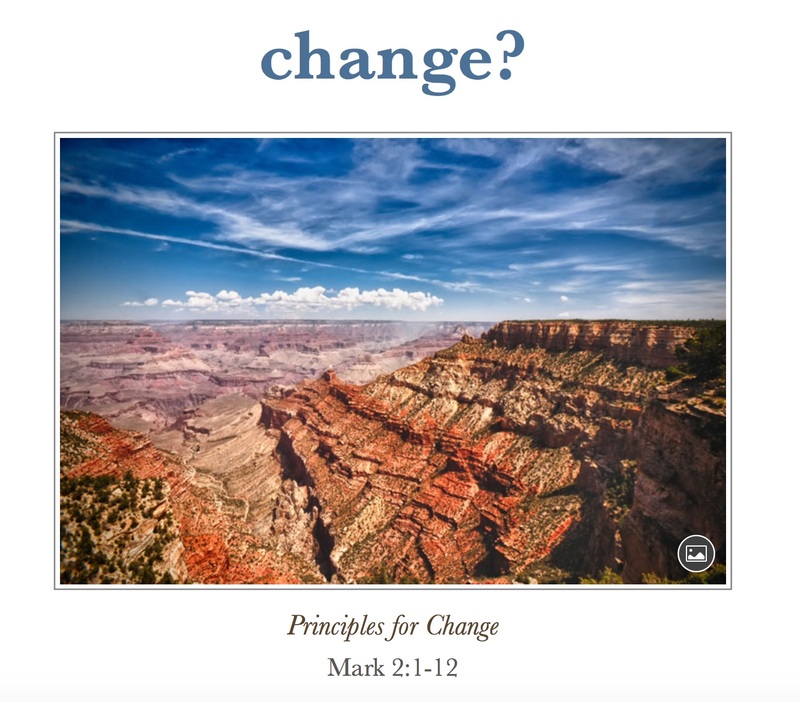 He had a grand time and we got what we needed, the sermon topic was “Principles for Change.” We chuckled as we read the bulletin, God had a message for us again! But the scriptures seemed an odd place to focus on change, or were they? The sermon continued. Through the power of God, we can change. We become new creations. Old things become new. Much like this paralyzed man. Didn’t he experience change? Our lives change, too, when we meet Jesus. Bill and I have both changed drastically since we both met Jesus in our younger days. But it is a life long process to get to where we want to be. To really change! We know we have to want to change. But I’ve wanted to change this “quirk” and it’s taken longer than we want. Come on Pastor, help me see what more I need to do! We have to ask, how do we prepare to change? Much like the paralytic. The first principle is to be surrounded by friends and family with faith. He had four friends he trusted and depended upon! And then as we met the Lord, we first need to allow our hearts to be changed. And that is acknowledging we are sinners and are in need of a savior. Jesus clearly saw the man’s heart and his faith. So his sins were first forgiven and then he was able to walk. Psalm 103:2-3 Bless the LORD, O my soul, And forget none of His benefits; Who pardons all your iniquities, Who heals all your diseases…. In other words, if you want to see positive changes, you want to be surrounded by people of faith who are wise! I’m thankful my husband is very wise! And we are blessed with friends and family who are also living for the Lord. This paralyzed man needed friends to help him. Then he caught their faith as they brought him to Jesus. No one wants to be a bother, but to change, we need to bother others. To confess our sins not only to God but to each other. The process is to first seek the PARDON or forgiveness. And that was what he did, by approaching he Lord, even if on a mat! Then to accept the POWER of the Lord, “take up your mat.” And finally, allow Jesus to work from the inside out. First the forgiveness and then he could walk! So how do I apply this? Today, we had to miss church due to the round trip to return our grandson. Instead, as we rode, we talked and talked….about this matter! So here are some notes from our discussion. I wish I could have taped it. We do talk about the state of marriage a lot. Because we are surrounded by married people. And we want the best for them…but like us, they need to WANT the BEST for their marriage. Interesting how our culture wants marriage for all. But it is only for the alternative marriages that the media seems to promote. If we want to talk about a covenant marriage as designed by our Creator, if we are a believer in the God of the heavens and earth, then we are seeking to be married as God intended it. When a man talks harshly to wife, he is called an abuser. When wife does it, she’s “just a nag.” Men say they don’t hear their wives when they are nagging them. Have you noticed, you don’t hear jokes about wives tuning out husbands, but wives say it all the time. Oops, I do accuse Bill of not hearing me. So maybe I am a bit of a nag at times. I need to watch my what comes out of my mouth. Instead of saying, “Bill do this or that!” Say, “Bill, would you mind doing this or that?” Geez, is that all I need to do? As we finalized our minimalism – After 40 years together, about all we kept were our family pictures. They define who and what we are. When people divorce, what happens to the pictures? We decided when we divorced, we would give them to our daughter. How do you think she would have enjoyed them? 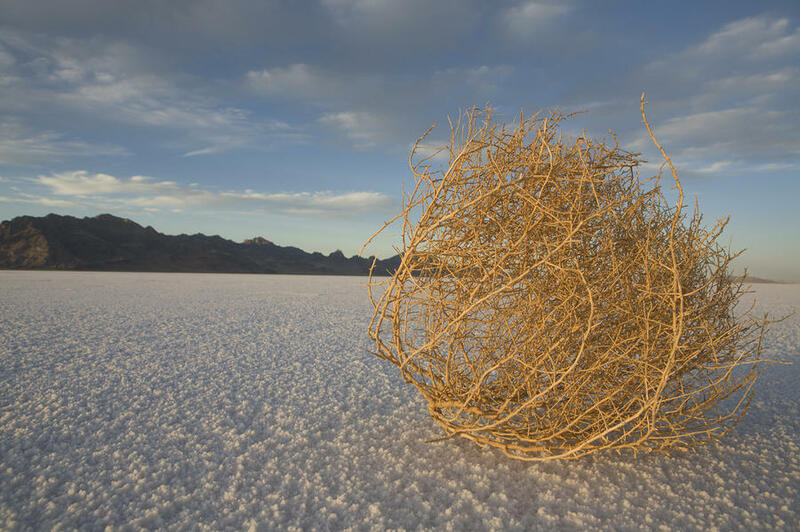 Looking at all the fun times we had? Would she feel joy or sadness? Happiness or heartbreak? We’re so thankful we are continuing to make family memories in our pictures. We don’t teach children how to be married. They pick it up watching parents and world around them such as TV. What kind of marriages are being promoted? All we can do is pray our daughter sees our marriage as different from what is promoted. In fact, we are so happy to say she has told us more than once, she is so grateful she was raised by two parents who love each other, and her. And now that we have grandchildren, this is even more important as we help her as needed. Going deeper, Bill no longer lets me tell him what to do anymore! Now that’s the CHANGE I needed. He’s a grown man, a college graduate, who graduated with honors as he likes to remind me! He asked me, “Do you know how it makes me feel when you try to direct me? Is there something wrong with me?” Oh NOOOOO!!!! I’m so blessed I have such an honorable and wise husband. What’s wrong with me that I continue to do this? Fortunately, we have a desire to succeed! We want it all!!! So I just have to ask for forgiveness, once again. This is not the first attempt at this….but this is the last. My dear husband, please forgive me once again for telling you what to do. I’ve really worked on this and I’m sure I get it now! Friends, will you hold me accountable? Aren’t we happy grandparents? 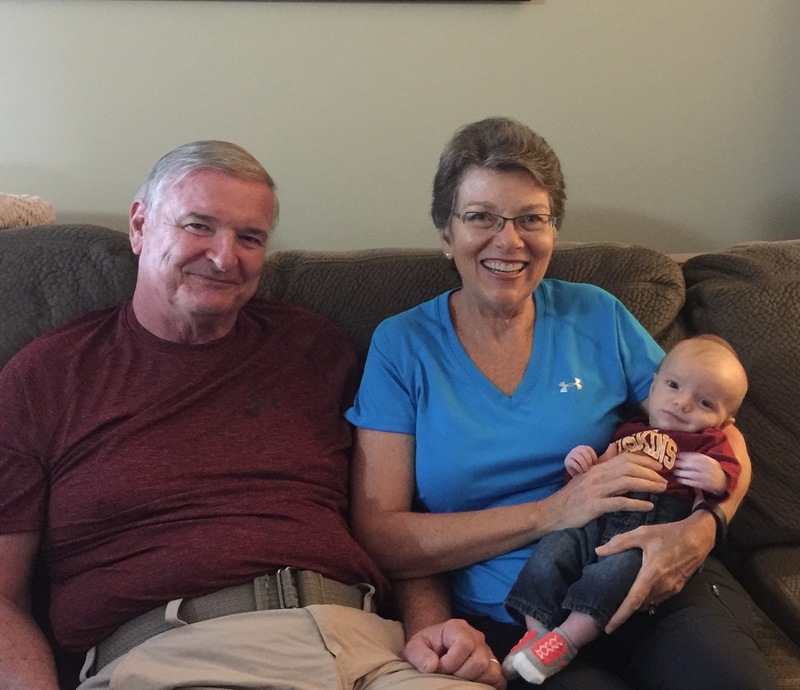 With our two month old grandson this weekend.